Miles to go: Automobile makers will likely have to spend more to ensure that their products consume less fuel than they currently do. New Delhi: The Petroleum Conservation Research Association (PCRA), the government agency responsible for setting stan-dards on the use of fuel, has said mandatory fuel-efficiency norms for automobiles will be in place in less than two years. The automobile industry is opposed to such norms because it could increase manufacturing costs. “We are certainly not in a two-year mode. Even though there could be resistance from the industry, we plan on notifying the standards, which will be mandatory and not voluntary," said Ravi Capoor, joint secretary and executive director, PCRA, while participating in a round-table discussion hosted by the Centre for Science and Environment (CSE), an activist environmental group, in Delhi on Thursday. Mint had reported on 15 August that the government proposed to introduce fuel-efficiency norms, despite opposition from the automobile industry which will likely have to spend more to ensure that its products consume lesser fuel than they currently do. G.K. Sharma, director, technical, national automotive testing and R&D infrastructure project, set up jointly by the government and the automobile industry, said the industry had to be given more time to meet the norms which had to be voluntary. The head of CSE said the time for voluntary standards had passed. 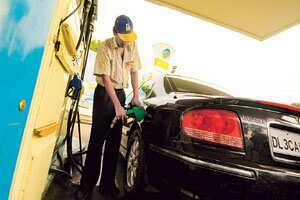 “The auto fuel policy was released in 2002 and the industry has had all the time for voluntary standards. It is clear that they have run out of time," said Sunita Narain, director, CSE. Before PCRA can arrive at fuel efficiency norms, it needs data on the current fuel efficiency of automobiles. Atanu Ganguli, assistant director, Society of Indian Automobile Manufacturers, an industry lobby, said the industry had the data but did not know who this had to be submitted to. Capoor said PCRA had already been identified as the agency that would analyse the data and come up with norms. “One of the most important issues is to decide whether we want standards based on mileage or carbon dioxide emissions or a blend of both. Secondly, there is the question of light vehicles versus heavy vehicles and how we tackle that, and thirdly, we think that the entire transport sector has to be considered—not just the small cars sector," said Capoor. Currently, the transport sector accounts for almost half the oil consumption in the country, of which 80% is used by diesel-based vehicles, typically heavy trucks. “We should not leave any vehicle out of the purview. We don’t need to follow what the rest of the world has done and we need standards not only for petrol and diesel but for CNG (compressed natural gas) as well," said Sandeep Garg, joint director, PCRA. PCRA, the industry, and other organisations, agencies, and government arms involved will meet within the next 10 days to discuss the issue.